10 Cool Places You Should Not Miss When In Greenhills - Federal Land, Inc. 10 Cool Places You Should Not Miss When In Greenhills - Federal Land, Inc. Though San Juan City is the smallest in Metro Manila, it certainly has big things to offer. The city is home to shopping centers, entertainment hubs, topnotch schools, premier hospitals, exclusive clubs, and food crawls. 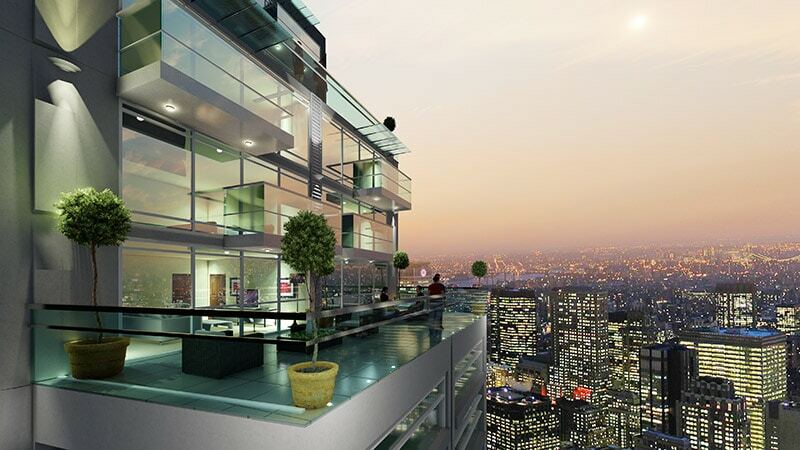 It also a prime real estate with easy access to Makati, Ortigas and Bonifacio Global City central business districts. Its upscale status complemented with a proud history makes it an idyllic place to live, work and play. 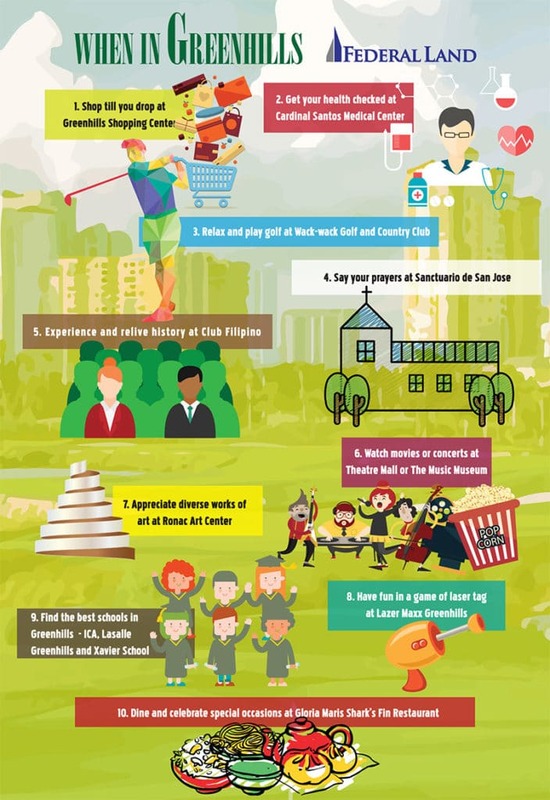 So from golf courses to shopping centers to music theaters, here are the 10 things you should not miss when in Greenhills, San Juan City. 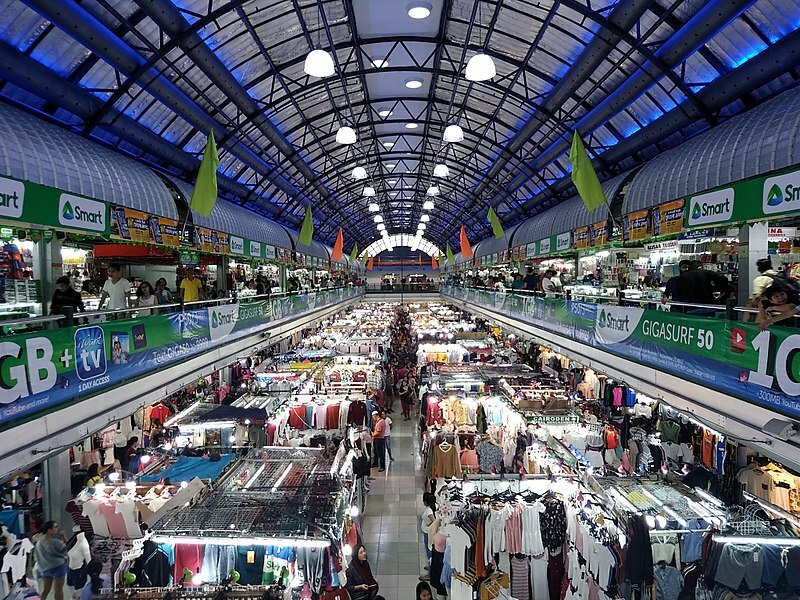 Known as a “tiangge” haven, Greenhills Shopping Center is one of the go-to places of bargain hunters looking for great finds at affordable prices. With over 2,000 stores within its malls and tiangge section, Greenhills Shopping Center has dedicated sections for clothing, furniture, décor, grocery, entertainment, and pearls – a definite something for anybody. For branded items and other commercial needs, there are several malls within and near San Juan City such as the Promenade Mall, Robinsons Galleria, SM Megamall, and Shangri-La Plaza. Retail giants Plains & Prints, Celine (CLN), Bayo, Kamiseta, Bench, Folded & Hung, Toby’s, Odyssey, Astro Vision, and Ricky Reyes started as small shops at Greenhills Shopping Center. Greenhills Shopping Center is a world-famous pearl hub, where both local and international celebrities, fashion designers, dignitaries, and pearl collectors come to buy pearls. 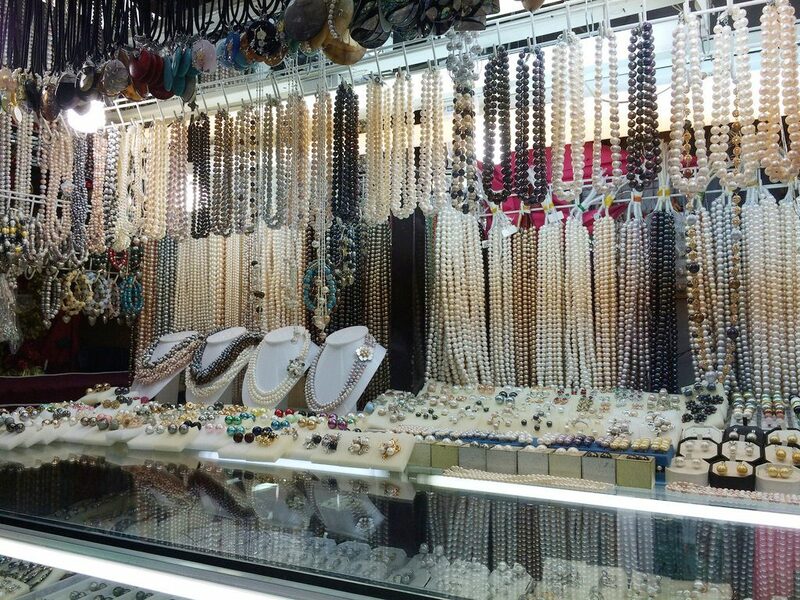 Famous people who visited the Greenhills pearl market include Rihanna in 2013 and Queen Sofia of Spain in 2012. 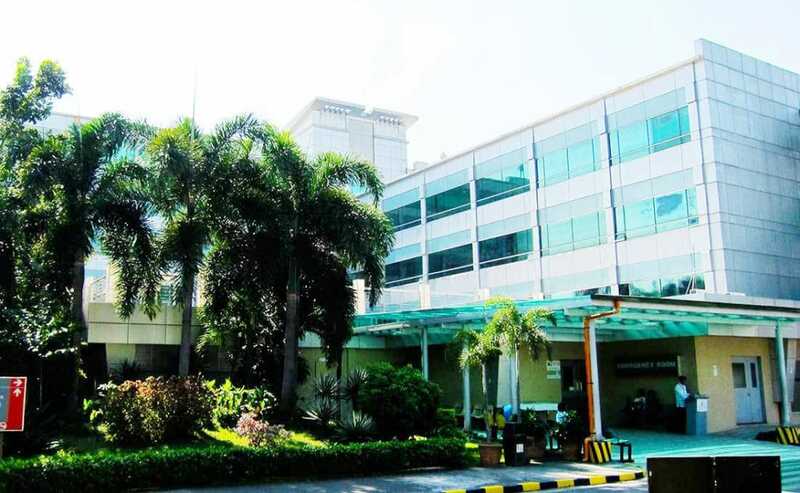 Founded by the Maryknoll Sisters before the World War II as the St. Paul’s Hospital of Manila, Cardinal Santos Medical Center is one of the Philippines’ leading hospitals specializing in the fields of cardiology, neurosurgery, oncology, and rehabilitation medicine. It is also known for its expertise in pediatrics, obstetrics, and gynecology, pulmonary medicine, nephrology, urology, and minimally invasive surgery. In recent news, Cardinal Santos Medical Center was awarded the DOH Star Awards 2018 Top 10 (Level 3 category) by the Department of Health during the 69th Philippine Hospital Association’s Annual National Convention. A favorite of young and season executives, Wack Wack Golf and Country Club (WWGCC) is one of the country’s most exclusive and elite golf and country clubs. WWGCC is mainly known for the two 18-hole professional golf courses: the East and the West courses. The East course, with its rolling greens, water hazards, and tricky Par-3, Hole No. 8, is known to be the tougher course. 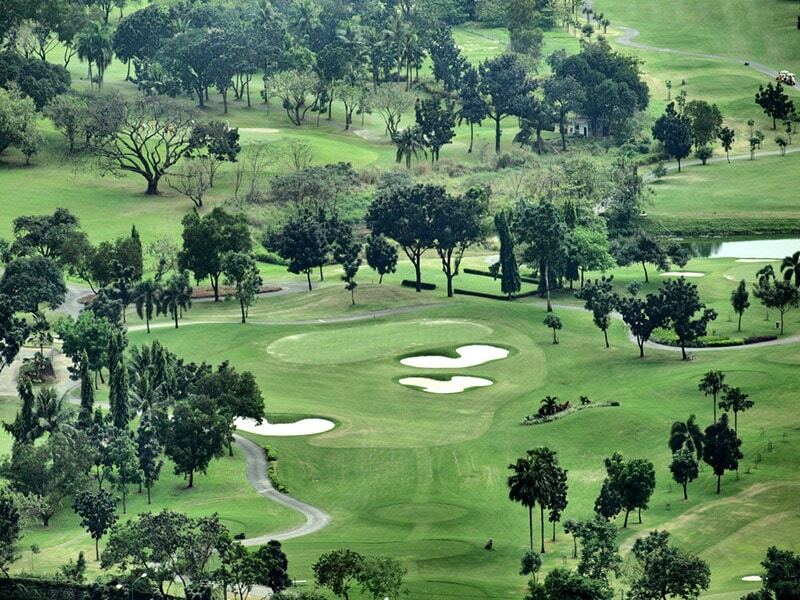 It is host to prestigious events such as the Asian Circuit, and Philippine Golf Open Championship. The West course, on the other hand, is more of an everyday course enjoyed by the club members, and their guests. 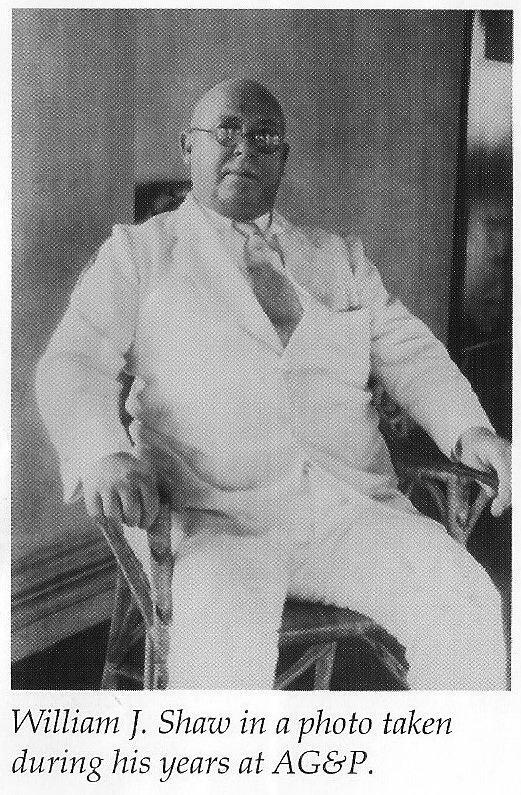 William James Shaw founded WWGCC in 1930 after Larry Montes, a caddie who won the Philippine Open Tournament in 1929 at Manila Golf and Country Club, was asked to leave the tournament celebration. WWGCC open door policy welcomed all golfers without discrimination. A shrine to Saint Joseph, husband of Mary, Santuario de San Jose in East Greenhills is dedicated to lead its parishioners and their families to piety, like St. Joseph led the Holy Family. 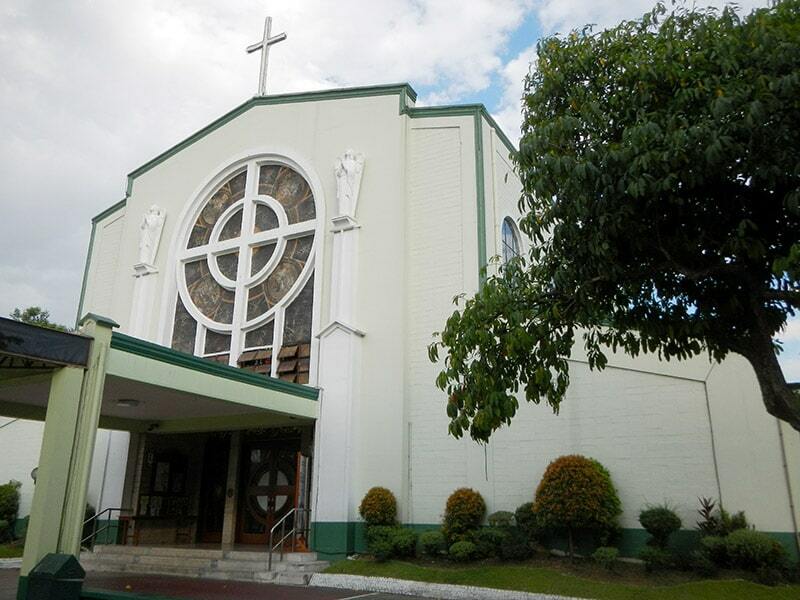 Santuario de San Jose is the home parish of the Holy Family Chapel in Greenhills Shopping Center, and the Immaculate Conception Chapel, and the Sacred Heart of Jesus Chapel in West Crame. 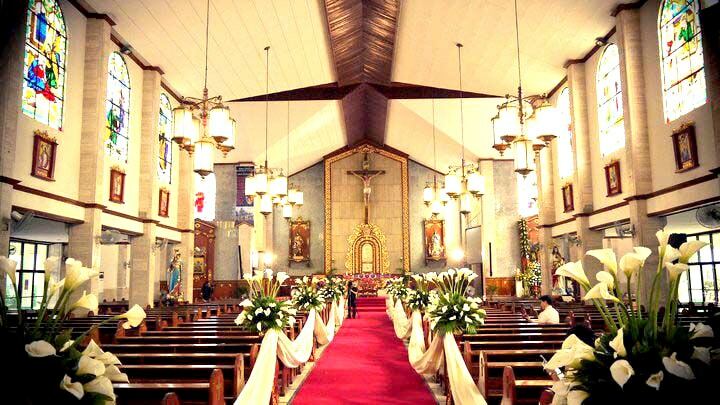 With its simple elegance and exclusive location, Santuario de San Jose is also a popular location for weddings. The interior is a mix of red, gold and wooden accents with stained glass windows giving a cozy and classy ambiance. While its location within exclusive subdivision means the ceremony is solemn and undisturbed. Within the upscale city of towering condominiums, posh subdivisions, vast shopping centers, and exclusive golf club of Greenhills stands an actual piece of history. Founded in 1989, Club Filipino is the first exclusive social club in the country. It is established as an elite gentlemen’s club, with the Ilustrados and Filipino politicians as its first members. 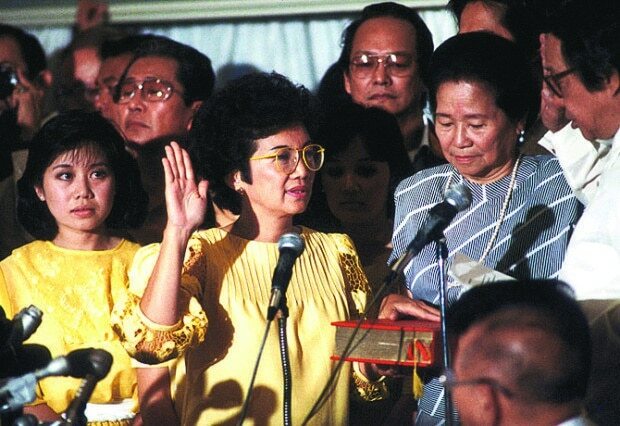 Throughout the years, the club hosted several significant political events that shaped the country, most notably the first celebration of Rizal Day in 1898 and the presidential inauguration of Corazon Aquino in 1986 People Power Revolution. Today, Club Filipino holds balls, parties, and conferences to its members. Its present amenities include swimming pool, tennis, badminton, and squash courts, bowling alleys, outdoor restaurant, salon, and “Kalayaan Hall,” an indoor events/reception room. More than a shopping mecca, San Juan City is also a hotbed of creativity and arts. 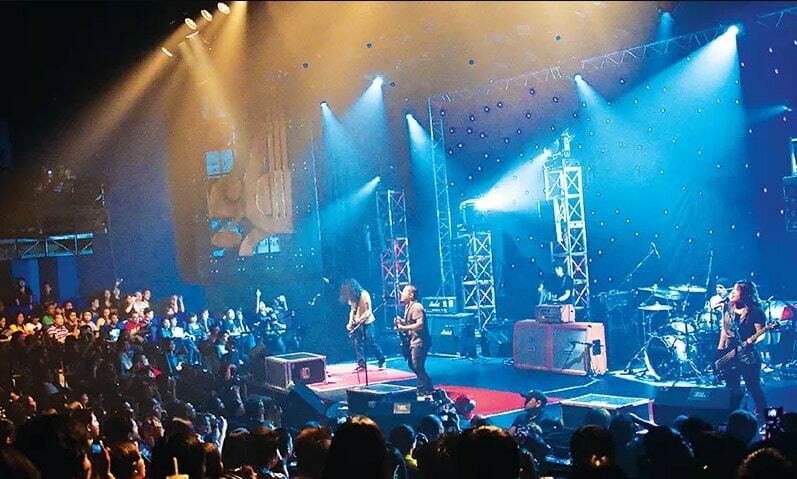 The Music Museum is a cultural metropolis that hosts all things music, theater, and entertainment of all genres. Established by Kuh Ledesma in 1988 to give the local audiences a taste of New York and Las Vegas, the Music Museum is a combined theater-restaurant where guests could eat and drink during performances. The Music Museum has been the stage for countless Filipino talents and houses several showbiz memorabilia such as Nora Aunor’s “Tawag ng Tanghalan” trophy, Apo Hiking Society’s first entertainment contract, and Lisa Macuja’s first ballet shoes. The Music Museum has expanded to add dining, shopping, and entertainment hub complex now known as the Music Museum Group. It includes Shoppesville Plus, Theater Mall, Promenade Mall, and Teatrino, the biggest little theater in the city. Ronac Art Center, a brainchild of Bigboy Cheng, is Metro Manila’s newest hub for contemporary art and retail. It houses some of the hippest boutiques in town like toy store Secret Fresh; German shoe retailer Unschld; one-stop skate shop We Legendary, Asian streetwear Terminal, concept store Progress; plus, a slew of diners, burger joints, coffee shops, and a yogurt bar. It also features gallery spaces, events halls, and a basketball court. 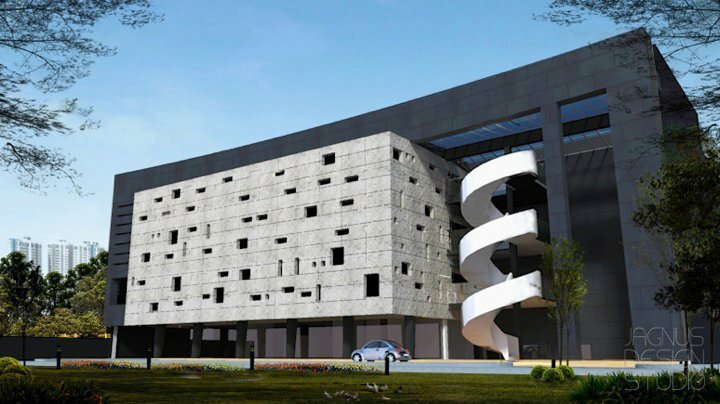 The Ronac is also known for its interesting façade, which is inspired by a mattress. The large gray block with uneven windows is the foam, while the spiral staircase is the spring – an incredible representation of the family’s other business, Uratex. This futuristic fun for the whole family and friends is a modern take on the backyard staple game of tag. 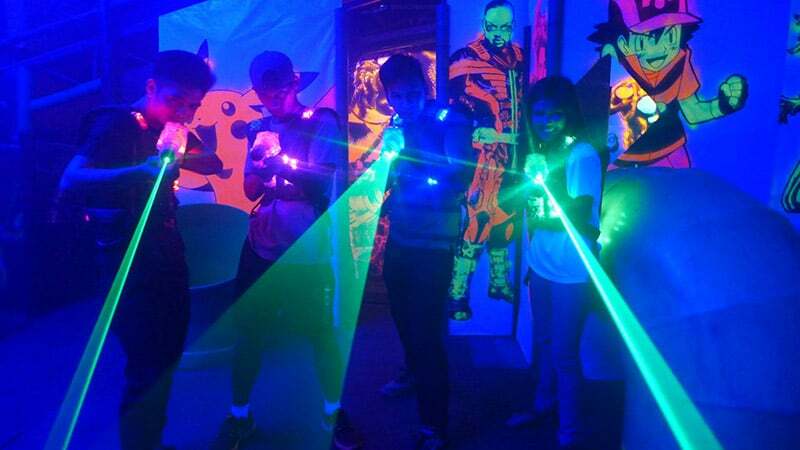 Lazer Maxx in Greenhills involves high tech laser guns, glowing vests, inflatable obstacles, bad villains, and “The Incredibles” theme song to provide an epic superhero experience. 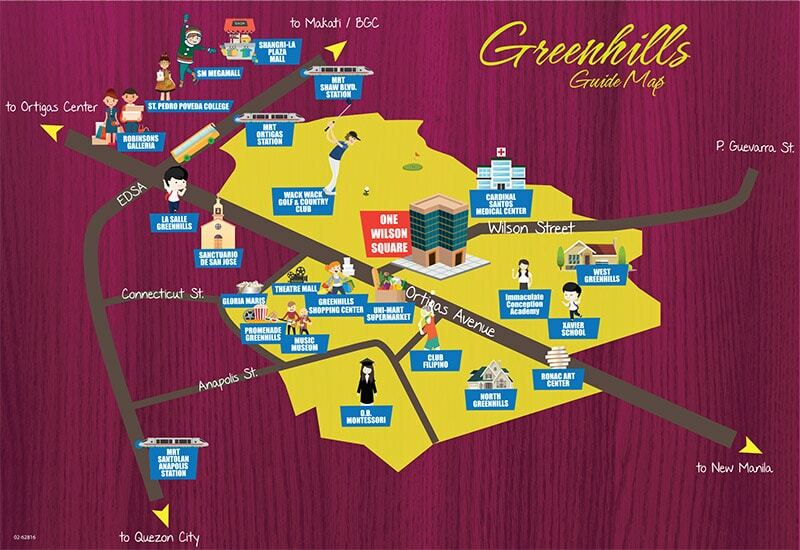 A home in Greenhills, San Juan means your children are within arm’s reach of some of the best schools in the country. For instance, a residential condo in One Wilson Square puts you and your family right in the middle of several exclusive schools: OB Montessori Center, six-minute drive; La Salle Green Hills, seven-minute drive; Immaculate Conception Academy, eight-minute drive; and Xavier School, nine-minute drive. 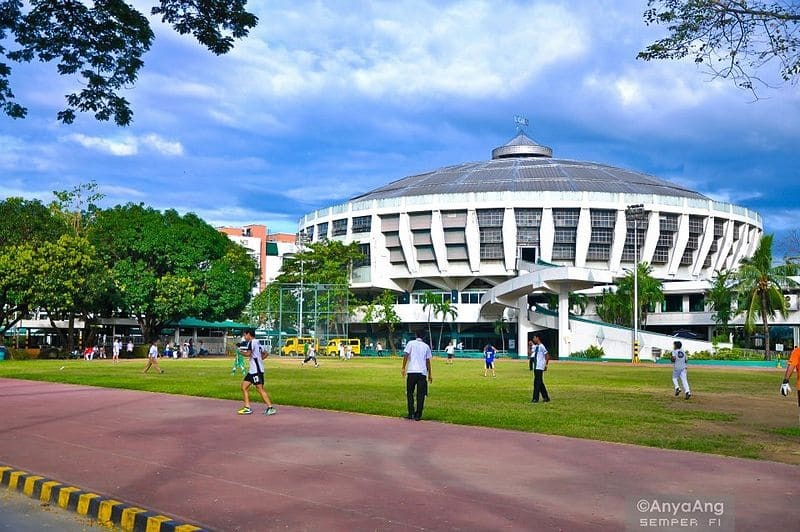 For higher learning, San Juan is home of the Asian Institute of Journalism and Communication, five-minute drive; Polytechnic University of the Philippines – San Juan Campus, six-minute drive; St. Augustine School of Nursing, seven-minute drive; and St. Pedro Poveda College, 10-minute drive. And since San Juan City is in the middle of Metro Manila, going to top schools in other cities can be convenient. Going to Reedley International School in Pasig City is only an 18-minute drive; International School Manila in Bonifacio Global City, Taguig is only a 25-minute drive; Ateneo de Manila University in Quezon City is only a 17-minute drive; and University of the Philippines-Diliman Campus in Quezon City is only a 25-minute drive. 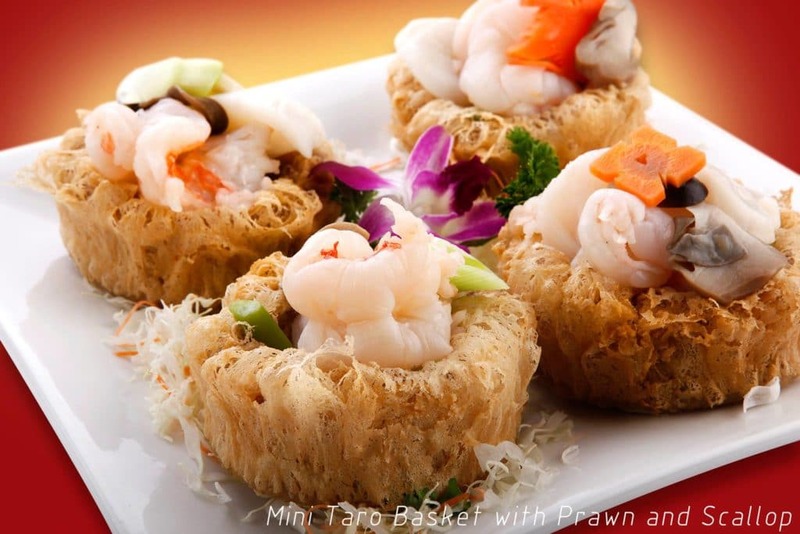 Craving for authentic Cantonese cuisine? Gather your family and friends for fine dining at the Gloria Maris Sharks Fin Restaurant in Greenhills. With the finest ingredients, Hong Kong chefs, and courteous staff, Gloria Maris will take the fine dining experience to a whole new level. The Gloria Maris in Greenhills caters to a variety of palates: the Hot Pot, a casual Hotpot dinner; the Dimsum Kitchen, a popular weekend breakfast hangout; the Main Dining accommodates fine dining lunch and dinner; the VIP Rooms reserved for intimate gatherings; and the Banquet Hall to celebrate weddings and other special occasions. Want to be in the middle of these hotspots? Federal Land, Inc.’s One Wilson Square has ready for occupancy condominium units for sale and for rent. Located within the upscale Greenhills, San Juan City, and just a stone’s throw away to Ortigas and EDSA intersection, One Wilson Square provides your family convenient access to central business districts, and spacious and exquisitely appointed homes of comfort and luxury – created with careful attention to every aspect of life. Federal Land opens the new showroom and information center of Mi Casa, its tropical-inspired development in Metro Park, Bay Area. The Mi Casa showroom features fresh and elegant interior designs that truly captures the tropical-feel of the islands of Hawaii. With the World Bank GDP growth projection of 6.4% and new pro-growth economic policies, the Philippines is poised to sustain its economic rise. The various infrastructure projects of the government and the private sectors hail optimism to both local and foreign investors across all segments, but especially for the real estate industry. Marikina City is a mix of a picturesque old city and a verging urban modernization featuring a thriving economy, modern malls, ancestral houses, wide green parks, and friendly citizens. Federal Land, Inc. is a member of GT Capital Holdings and a proud partner of the Metrobank Group. It began in Manila as Federal Homes, Inc. in 1972 but has since grown into Federal Land, Inc., a prime real estate developer in the Philippines. For over forty-five years, Federal Land has been creating properties built on the values of trust, reliability, and integrity. It is the developer of many large-scale developments: residential condominiums, office buildings, retail and commercial centers, mixed-use townships and masterplanned communities. To be working for a company for years is a good indication of fruition of goals. To stay more for years makes one look forward to achieving growth and success with the help of new and seasoned employees. Federal Land instilled in me values that made me a more resilient person despite the challenges I face as an HR practitioner. One of the main factors that make employees stay long here at Federal Land is its good working environment. I love what I do in my job and the people I work with. The learnings and experiences that we have acquired here at Federal Land make us who we are today. Working for Federal Land has been a learning ground for me since it was my first ever sales-related job experience. I improved so much on communicating and socializing with my clients through the years. I can confidently say that Federal Land played a significant role in my life since I was able to suffice not only my wants but also my family’s need. Selling at Federal Land is a great opportunity that helped me build a strong, stable and fulfilling career. Federal Land helped me achieve a better standing in life, making me capable and competitive. Federal Land has changed me a lot, professionally, socially and financially. I have never dreamed of being a real estate sales person. I just heard and read success stories before. But now I can proudly say that I am part of the success story, through hard work and perseverance. Federal Land, Inc. is committed in protecting your privacy. We promise to keep all the information you share confidential. To improve the customer experience, this website/page stores cookies but not personally identifiable information which are not shared to third-party entities. We assure you that the data you are providing us will be treated with utmost confidentiality. We're conducting a survey and your inputs would be appreciated. Click the button below to start the survey. Thank you for your participation! Buy your dream home at terms you can afford. Your inquiry has been received. We will contact you soon.